Liczba stron: 600 Jest to ujednolicona liczba stron, która ułatwi Ci porównanie długości książek. Każda strona Legimi to 200 słów. "I hate grammar! Why are English prepositions so difficult?" "I don't know why we say it that way. That's just how we speak." "There's no logic to prepositions. You just have to memorize them." Here's a secret for you: English prepositions are logical. Why your English Teacher was Wrong Imagine a farm that grows a lot of different plants. On the surface, you see all the leaves and branches. These leaves and branches are the different dictionary definitions that seem to be disconnected and random. These “surface meanings” are what native speakers are aware of. However, underground we find the root of each plant. The root is the logic that all the dictionary definitions are based on. This underground level is part of the subconscious mind, so native speakers aren’t consciously aware of it. 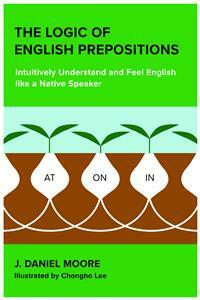 This book teaches you the hidden, logical relationships that give prepositions their meaning. What's in this Book? This book contains seventeen of the most common and confusing prepositions in the English language. Each preposition has its own chapter that's divided into sections that guide you through the process and help you learn more easily and more effectively. The sections are: A) Example Sentences (there are over 450 examples); B) The Logic, which includes the key idea(s), an explanation, and etymology notes; C) Detailed explanations of how the logic works in the example sentences from section A; D) Verbs that often use each preposition; E) Phrasal verbs; and F) Idioms. At the end of the book are a few maps of the logical relationships. Some of the ideas in this book are complex, but this book is written in a way that is as easy to understand as possible. In everyday speech, English speakers omit a lot of grammar words, such as the words "that", "in order (to)", and sometimes even the preposition "of". In this book, these words have been kept as much as possible so that the reader can focus on the content of the book without confusion. For that reason, it shouldn't be very difficult for learners who have at least a B2 (upper-intermediate) level. However, this book might be difficult for learners who have a B1 (lower-intermediate) level. If you can understand everything in this description, then you can probably understand the book. About the Author J. Daniel Moore is a language learner and an experienced ESL/EFL teacher. A native speaker of English, he also speaks Spanish, some German, and some Japanese. This book is dedicated to my grandparents. Thank you for all of your love and support. I love you. This book wouldn’t be possible without the feedback of my students and friends. In particular, I thank those students who participated in the early stages of what has now become this book and who allowed me to successfully test my ideas with them. Every language has it’s own personality. A language is a living thing that lives through its speakers. Just like a person changes and grows over time, languages do the same, but more slowly. Each language has its own boundaries and ways that it likes to look at the world. This doesn’t mean that a speaker of one language can’t learn how to think in another language, it’s just that if you really want to learn a language well and be able to think in it and feel it, you have to understand that language’s personality and how it looks at the world. This affects everything in a language, including prepositions, articles, perceptions of time and space, uses of verb tenses, and more, and there’s increasing scientific evidence to support this idea. Let’s look at an example. Spanish and German both use something that’s called “grammatical gender”, which means that some words in the language are “masculine” (male, related to “man”) and some words are “feminine” (female, related to “woman”). It doesn’t matter what the word is. English uses “biological gender”, which basically means that things that aren’t male or female in the real world are called “it” because they don’t have a real world, biological gender. For example, a chair can’t be a man or a woman, but in Spanish the word “chair” is feminine. This is just one small example, but here’s the most important point: it’s possible to perceive one thing in many different ways. It’s possible to perceive a bridge as either “sturdy” or “fragile”, “dangerous” or “pretty”, etc... All of these words can describe a bridge, depending on how you want to look at it. The personality of every language determines the ways that native speakers are likely to perceive things at a basic level (meaning subconsciously), but it doesn’t mean that a Spanish speaker can’t think of a bridge as “beautiful” or that a German speaker can’t think of a bridge as “sturdy”. There are many different ways to look at things and that’s one reason that languages are so different from each other. The purpose of this book is to help you discover and feel how the English language looks at the world. This book is only about prepositions, but prepositions are one of the most important parts of a language because they contain a lot of a language’s personality. This is a book about prepositions, so let’s look at an example that uses them. In English, the verb “to depend” uses the preposition “on”. In Spanish, the verb “depender” uses the preposition “de”. The English word for “de” is usually “of”. So, if we literally translate “depender de” into English, we get “to depend of”. A native English speaker would never say that. It works in Spanish, but not in English. Why? Because the English language has it’s own personality, and so does the Spanish language. This book will help to teach you the personality of the English language and how it looks at the world. How? With logic. Specifically, the logic that the English language applies to its prepositions. I’m sure that your English teachers in the past told you that “there’s no logic to prepositions” and that “you simply have to memorize them”. I’m an English teacher (ESL/EFL) and I used to think this, too. However, I’m also a language learner. In 2017, I was teaching myself German. I already had an intermediate level in Spanish, and in both of these languages, I hated prepositions. I was always making mistakes and I couldn’t seem to figure out why these languages use prepositions so differently compared to English. One day, I was talking to a friend (who’s a native German speaker) about the different meanings of the German preposition “auf”. This preposition has meanings related to time, space, etc..., but the translations into English include “on”, “up”, “at”, and even “for”, depending on the context. I started to notice something interesting: it seemed that at least some of the dictionary definitions were closely connected, but some of those connections were abstract. I started to wonder if all of the dictionary definitions were connected in some way. So, I started with the simplest and easiest definitions and tried to find any connections. From that point, I started looking at other definitions that seemed different, but I tried to connect them to the easier definitions in a logical way. I wanted to make sure that I wasn’t just imagining the connections, but that I was actually finding connections that do exist inside the German language itself. So I asked my German friend questions about certain definitions so that I could see if it were possible to connect all the definitions in a way that still made sense from the perspective of a native German speaker. At first, he told me not to try because there wasn’t any logic that connected them and I just had to memorize how to use them. But I wanted to try anyway. A couple of weeks later, I had to stop learning German for a little while, but before I had stopped, it seemed that my idea was working. It seemed that there actually might be a hidden logic that connects all the different dictionary definitions, so I decided to start thinking about how we use prepositions in English. The more I thought about it, the more it became very clear that English prepositions are extremely logical, and I’ve found no exceptions, even when a preposition is used as a noun or a verb (though I have found a few cases that are difficult to explain). But why do English teachers say that there isn’t any logic? Let’s imagine a farm that grows a lot of different plants. On the surface, you see all the leaves and branches of the plants (the “in” plant, the “on” plant, the “to” plant, etc...). These leaves and branches are the different dictionary definitions that seem to be disconnected and random. These “surface meanings” are what native speakers are consciously aware of. However, under the ground we find the root of each plant. The root is the logic that all the dictionary definitions are based on. This underground level is part of the subconscious mind, which means that native speakers aren’t consciously aware of it. Just like on a real farm, the roots of two or more plants can touch and connect sometimes. We’ll see many special connections between prepositions – for example, the extremely important connection between “at”, “on”, and “in”. Prepositions aren’t just little grammar words. They’re critically important and hold a lot of meaning, and mastering them will allow you to think more like a native speaker. Think about it this way: we know that languages slowly change as time passes, but the speakers of a language don’t just randomly apply words to new contexts. There’s a logical reason why words are applied to new contexts. When this happens, we get an extension of the original meaning (which might be more abstract), or we get an entirely new meaning. Either way, the new meaning is usually based on the original logic of the word in some way. The best example of this change in English is phrasal verbs. In fact, phrasal verbs can’t exist if there’s no logic, especially because sometimes native English speakers spontaneously create phrasal verbs to fit very specific contexts. This is only possible if there’s a logic and a feeling that we can then apply in new ways to fit the context. It’s important to remember that although prepositions are logical, there’s no single book or other resource that will magically solve your language learning problems. The good news is that this book is not about grammar rules or memorizing definitions. It’s about how English prepositions feel and how the English language applies logic to them. I highly recommend that you get my other book, The Logic of English Prepositions Workbook, which has exercises with detailed answers that help you apply what you learn in this book. You don’t have to buy the workbook, but you do have to apply what you learn in some way. It will take some time, creative thinking, and active practice, but this book will allow you to learn these things more easily and you’ll start thinking like a native speaker much faster than normal. As with any skill, I can give you the tools, but you have to put in the work. In other words, you have to take the knowledge in this book and make it part of your active ability by speaking and writing. You will make mistakes. It’s an unavoidable and natural part of learning any skill, but this book will also help you understand why you make those mistakes. As a final note, this book is not for everyone. A few of my students didn’t like the approach and some people will probably say that I’m wrong and that there is no logic. However, this approach has worked very well for many of my students (both intermediate and advanced) because it helps you get inside the English language in a way that allows you to start intuitively feeling the language like a native speaker does. I hope you enjoy the information in this book, as well as the method that I’ve developed in order to help you learn and understand it. The main part of this book is a guide through the logic (and feeling) of seventeen prepositions. Most of the prepositions that we’ll look at are the small ones, like “in”, “on”, “to”, “at”, and “for”, and almost all of them are extremely common. We’ll look at example sentences with detailed explanations of how the logic applies in each sentence. We usually use these words as prepositions, but sometimes we can use them as verbs, adverbs, etc..., so I’ve included some of those in the example sentences. There are six sections for each preposition. You can use this book any way that you want, but I recommend that you do not skip any section because this process is designed to help you learn better in a way that’s based on scientific principles of learning. Section A has example sentences without explanations. However, for some people it’s easier to look at the logic first (section B), and then go through the example sentences. Again, I don’t recommend this, but do whatever works for you. My family goes on vacation in the summer. I’ll be home in two days. The bus arrived in time. Section C gives you the labels for each group that you saw in section A and detailed explanations of every example sentence from section A. This is the main section for each preposition and it’s the section that will teach you how to understand and feel the logic. Whenever possible, I also give you alternative ways to say the same sentence. These alternatives usually use other prepositions that you can use in the same context. Section D shows a table. This table has examples of verbs that often use that preposition, excluding phrasal verbs. Section E gives you some example sentences that use phrasal verbs. After each sentence is a detailed explanation of what that phrasal verb means and how it connects to the logic. For some phrasal verbs, I give you more than one example to show how the logic can apply to the same verb-preposition combination in different contexts and with different meanings. Lastly, section F gives you idioms that use the preposition. After each sentence is a detailed explanation of what that idiom means and how it connects to the logic. There are some special terms (words) that you need to know. These terms will help you to more easily understand everything in this book. You don’t have to memorize any of these because we’ll apply them in specific examples and contexts later. You can always come back here later to check what these terms mean. The Logic: This is the underlying key idea of a preposition that is logical and allows you to “feel” it. Sometimes, there are two separate or slightly separate ideas behind the logic. In the explanations of the example sentences, I also provide synonyms or more specific versions of the key idea(s) when it’s useful (for example, “end point” → specific version: “destination”). This will help you understand things more easily. Remember that the logic can be applied in different and specific ways, but the key idea doesn’t change. Look at the picture below. This is a picture of an important part of the logic, which is that the logic of a preposition has a core and an area around the core. Many times, the surface meanings of a preposition will fit into the core of the logic. These are very clear and it’s easy to see how it works. Sometimes, however, the surface meaning will be somewhere outside the core. The farther away from the center it is, the more abstract the connection. So, sometimes it might seem difficult to connect a sentence to the logic, but I try to explain the examples in a way that’s easy to understand. One-way Preposition: A→ B. This is the most common way that prepositions function and it’s what you would expect based on the normal flow of a sentence (left to right). In other words, the word “way” in this context means “direction”. A→ B. For example, “The keys (A) are on the table (B)”. So, “one-way” just means that the meaning of the preposition applies from left to right, like normal. Two-way Preposition: There are a few prepositions that I call “two-way” prepositions. One-way prepositions go from left to right in meaning, but the meaning of two-way prepositions can apply in two opposite directions: left to right and right to left, depending on the context. This happens with some prepositions that don’t have an opposite word (examples of opposites are: to/from, up/down, etc...). For example, the preposition “of” doesn’t have an opposite and goes in two directions: “A→ B” OR “A ←B”. In many cases, the preposition “of” is a “part”, meaning that A is part of B. This is the normal sentence flow and goes left to right. In other cases, the preposition “of” describes some content. For example, “The table (A) is made of wood (B)”. The table isn’t part of the wood; the wood is the content of the table, meaning that the table consists of/is made of/is composed of wood. So in this case, the meaning of the preposition “of” is applied from right to left (A ← B). This is because the word “wood” (B) is on the right side of the sentence and the word “table” (A) is on the left side of the sentence. We read the sentence from left to right, but the meaning of the preposition is applied from right to left. If that sounds confusing, don’t worry. This is all explained in a very clear way using example sentences for each two-way preposition. Category words: The idea of “category words” is very important, and not just for prepositions, but for language in general. A category word is a word that represents the highest level category, like in a hierarchy. For example, the word “thing” is a general word that’s not specific. It’s also a category word. You can use the word “thing” to refer to a vehicle, an animal, etc... Starting with the word “thing”, we can create other categories. For example: thing → vehicle → car. We can get more specific and say “my car”, or “Toyota”. Another example: thing → animal → cat. We’re not only creating categories, but hierarchies, which will help you remember things more easily. We’ll see how this idea applies to specific prepositions later. Collocations and Chunks: A “chunk” of language is a group of words inside a sentence. This is a concept that some linguists use when studying language. The complete idea of “chunks” is a little complicated, but the basic idea is simple: words don’t usually work alone. For example, if you say, “It depends on what time he arrives”, this isn’t a bunch of individual words that are put together. Your brain processes these words and concepts as small groups/chunks. You can think of this like building blocks that you can fit together to create different sentences. If we divide our example sentence into chunks, it might look like this: “It depends on what time he arrives.” Notice that “depend on” is part of the same chunk. This is because the verb “to depend” always uses the preposition “on”. “What time” is one idea, and “he arrives” is another idea. We can change these chunks to get new sentences. For example, “I don’t know what time he arrives; It depends on if he arrives (or “if he arrives”); It depends on what time he leaves.” Each one of these pieces is like a single concept or idea. Ok, we know what a chunk is, but what’s a “collocation”? A collocation is simply two or more words that we often use together. In other words, they’re special chunks. A chunk is just a group of words, but a collocation is a group of words that often go together. For example, “fast food”, “make a mistake”, and “loud and clear”. Idioms are also special collocations/chunks because we don’t usually change the words in an idiom. A collocation can be as simple as a verb combined with a preposition that we commonly use with that verb. This can be a phrasal verb, or it can be the preposition that the verb prefers to use most of the time. For example, “depend on”. This isn’t a phrasal verb, as we’ll see next. First, we have the easiest and most basic category: a regular preposition that’s used normally. “The keys are on the table.” There’s nothing special here and it’s definitely not a phrasal verb. Also in this category are the prepositions that are always or almost always used with certain verbs. For example, “depend on”. In this case, “on” is just the preposition that we use with the verb “to depend”. There’s a logical reason that we use them together, but we’ll see that later. Second, there’s what I call “false” phrasal verbs. There are two types of false phrasal verbs. 1) Disconnected from the verb: For example, “I like to go on rides at the amusement park” → Go where? “on rides”. In this case, the preposition is attached to the word “rides”, not the verb “to go”. This works because of chunks. “I like to go” is one idea, “on rides” is another idea, and “at the amusement park” is another idea. Remember, we often group words together based on their relationship to each other. Lastly, we have “true phrasal verbs” or “real phrasal verbs”. This means that the meaning of the verb is changed. Usually, the meaning changes completely, but sometimes the meaning only changes a little bit. For example, “bring up”. This phrasal verb has a few different meanings, but the most common is “to mention”. In this case, we need the preposition “up” because the verb “to bring” by itself can’t mean “to mention”. Many phrasal verbs are just a different way to say a regular verb (like “to mention”). Many phrasal verbs also have more than one meaning. This is why learning the logic and feeling of each preposition is so useful. In fact, I have students who have started naturally and spontaneously using phrasal verbs that they had never learned before. Sometimes they try and fail, though, which is part of the learning process. Remember, in all three of these categories, the logic of a preposition will always apply. It doesn’t matter if it’s a phrasal verb or not. I simply give you these three categories so you can better understand this book and the English language as a whole. Connections: Any English teacher will tell you that the purpose of prepositions is to show the relationship between two or more things. However, prepositions also have connections to other prepositions. This is an extremely important idea that will help you feel the prepositions. In this book, “connection” means that part of the logic of one preposition connects with part of the logic of another preposition. The point where they connect is a specific meaning/dictionary definition. Remember the image of the farm. Connections happen “under the surface” (the roots connect). There are three types of connections: “touch”, “overlap”, and “special connection”. When two or more prepositions “touch” or “overlap”, the result is a shared meaning “above the surface”. When two or more prepositions have a “special connection”, they do NOT share a meaning, but they are clearly and logically connected in a special way. This means that special connections are only “under the surface” because we’re only talking about where the roots connect. Touch: “Touch” means that two prepositions share a meaning, but they’re usually not interchangeable. “Not interchangeable” means that you can’t change the preposition without changing the rest of the sentence. This is because it will either change the meaning of the sentence or make the sentence grammatically incorrect. Sometimes, two or more prepositions “touch”, depending on the context and meaning. The points that “touch” are two dictionary definitions. When this happens, you CANNOT use the two prepositions interchangeably. The logic of both prepositions can apply if you’re just applying general logic, but the English language only applies one of them (more on this later). Sometimes, both prepositions work, but you have to change the sentence a little if you want to use the other preposition. We’ll see specific examples throughout the book. Overlap: “Overlap” means that two or more prepositions ARE interchangeable in a certain context. This is because you can apply the logic of each preposition in a way that results in the same meaning/dictionary definition. You can simply change the preposition and leave the rest of the sentence the same. For example, “I was surprised at/by/with his skill”. The meaning doesn’t change, but using one preposition or another might sometimes give the sentence a slightly different feel because the logic of each preposition is different. All that happens is that the logic overlaps (AND English allows the prepositions to be interchangeable) in this particular meaning and context. It’s important to note that when two prepositions overlap, the meaning is the same, but the feeling is usually a little different. This is because each preposition has its own feeling, but we can apply the logic in the same context and get the same meaning. In a way, all we’re doing is looking at the sentence from a slightly different angle that doesn’t change the meaning. Again, we’ll see specific examples throughout the book. Note: one of the most difficult parts of learning prepositions is knowing when prepositions overlap, just touch, or are simply not applied to a certain context at all. Unfortunately, this is one of those things that you have to “get used to”, but as long as you practice a lot, this book will help make the process much easier. Just remember, you have to try to apply what you learn in speaking and writing, make mistakes, and learn from them. The more you practice, the faster you’ll improve. Special Connection: Don’t forget that all connections happen “under the surface”. “Touch” and “overlap” are about the meanings, which are “above the surface”, but “special connections” stays “under the surface”. So what is a special connection? A special connection is a logical relationship between two prepositions, often in time or space. The easiest and most basic examples are the connections like: “to” and “from”, “up” and “down”, “in” and “out”. But it’s not just opposites. We have a very special connection with the prepositions “at” (very specific), “on” (less specific), and “in” anything larger/less specific than “on”) when talking about time and space. For example, “It happened at 2.” “It happened on Monday.” “It happened in June/in 2010/in the 1990’s/in the 2nd century”. We can see that each period of time gets larger and less specific. We’ll see specific examples of this later in the book. Positive state/active state and negative state/inactive state: These concepts are probably the most abstract and hard to define in the entire book. They also have many different applications “above the surface”, which we’ll call “surface meanings”. Read the following explanation, but if it’s confusing, don’t worry about it too much. It will become clearer and clearer as you read the rest of the book. Some prepositions deal with the ideas of existence and non-existence. Sometimes it’s more appropriate and useful to use the terms “existence” and “non-existence” (or more specific versions, like “aware” and “unaware”), but with some prepositions it’s better to use the terms “positive state” or “active state” and “negative state” or “inactive state”. These ideas are very closely related to the ideas of “existence” and “non-existence”. Don’t think of the word “positive” as “good” or the word “negative” as “bad”. We’re not making a judgment about what’s “good”, so it’s like a “neutral positive”. For example, imagine a light. When you turn the light on, the light is active. We can also say that the light is in a “positive state”. The logic of the preposition “on” is a little complicated, but it’s always a “positive state/active state” (and usually also a “surface” or “platform”, but that doesn’t apply in this case). It’s very clear that a light that’s turned on isn’t “good”, it’s just active. The problem is that the idea of “active” doesn’t always fit perfectly, so we need the help of a more general concept or category word: “positive state”. Another example: if you’re sitting in traffic and the light is red, you have to stop, which might feel “bad” or “negative”, but remember, we’re not judging. The red light is on. So, the red light is in a positive state/active state. Even though “existence” and “positive state” are closely related, the reason the word “existence” doesn’t work as well as “positive state” in this case is because the physical body of the red light exists even if the light is off. So it’s better to talk about a “positive state/active state” here. The idea of a “negative state” is also neutral. You can think of these positive state and negative state like computer data: a “1” (positive) vs a “0” (negative). Or you can think of the science terms used when talking about protons and electrons: “positive charge” and “negative charge”. The point is that we’re not saying that something is “good” or “bad”, just “positive/active” or “negative/inactive”. Again, all of this will be much clearer when we talk about the specific prepositions that use these ideas. FINAL NOTE ABOUT THE LOGIC: One thing you have to always remember is that just because the logic of a particular preposition works in a certain context does not always mean that it will be correct. Things might “touch” or seem to “overlap”, but in a certain context we simply don’t say things that way in English. Things can be logical from a general view, but the English language – like any other language – has its own flavor and preferences about how the logic is applied (remember, every language has it’s own “personality”, just like a person). Also remember that there are cases where the logic overlaps and sometimes English uses both prepositions to mean the same thing, but sometimes it only uses one. You will learn more about this with specific examples and explanations later in the book. IMPORTANT NOTE ABOUT TRANSLATIONS: The words in your native language are not English words. There might be close or even exact translations between two languages, but the words are not the same. For example, in many cases the Spanish preposition “de” is the same as the English preposition “of”. However, “de” is spelled differently and pronounced differently, and there are times when “de” is used in Spanish, but we don’t translate it into English as “of”. The two words may be similar between the two languages, but “de” has it’s uses, logic, and meanings in the Spanish language and “of” has it’s own uses, logic, and meanings in the English language. So, you have to learn how the English language views things, which is the main goal of this book. Languages are complicated, living creatures, but this book will help you see, feel, and understand things from the perspective of the English language, exactly like a native speaker does. IMPORTANT NOTE ABOUT PARENTHESES ( ): There are many cases in English where we can omit words. These are usually grammar words and we can omit them because the context makes the meaning clear. For example, when we say “in order to” (which is about a purpose), we usually just say “to” because the meaning of “to” in this case is usually clearly implied by the context. For example: “I practice English everyday (in order) to improve”. An example of a word that’s not a preposition is the word “that” (used to connect two parts of a sentence). For example, “I think (that) he’s right”. In this book, I usually mark such cases – especially prepositions – by putting the words in parentheses ( ) → (in order) to. However, not all parentheses that I use in this book are for this purpose. Sometimes, parentheses just add extra information (like this, which is the real purpose of parentheses). A) Read the following sentences. If you don’t understand a sentence, highlight it or underline it. You can use Google Translate to check the meaning of a sentence, but be careful. Prepositions can cause problems for it and the translation might not be accurate. You can use a site like italki or Lang-8 if you want to ask a native speaker. When you finish the first group, think about what the preposition “of” means in those sentences. Repeat this process after each group. Then try to find a common idea that all of the groups share. When you finish, continue to the next section. If you want to look at the logic first and then read the sentences, go to the next section first and then return here. I don’t recommend that (especially if your English level is lower-intermediate), but you can do it if it works better for you. The last page of the book is blank. I’ve never been north of Los Angeles. He got 17 out of 20 on his test. I like the color of the sky at sunset. What does the word “of” mean in this group? I’ve always thought of him as an interesting person. I’ve always dreamed of living by the ocean. I like the idea of learning many languages. I drank five cups of coffee. A lot of people are at the beach. There’s a discount of 20 percent on all purchases. Note: The numbers below are for the logic, not the example sentence groups. Explanation of the logic: we use the preposition “of” when we’re talking about a part/characteristic of something, or when talking about what something is made of/composed of/consists of. Sometimes, you can apply both parts of the logic (meaning that the preposition “of” means both “part” and “content” in the same sentence). The preposition “of” isn’t very complicated, but if your language has a similar preposition, be careful. The exact use can be a little tricky. It’s also useful to know that there are times when we omit the preposition “of” because it’s implied and simply works in the background. Remember, I’ll usually put the preposition “of” in parentheses so that you know when this happens. For example: “a couple (of) dogs”. However, I don’t do it in this chapter because I don’t want to cause confusion. NOTE: The dictionary says that one of the meanings of the preposition “of” is “possession”. This is true because “above the surface” the logic can apply to the idea of “possession”, but I want you to forget that for now because it causes a lot of confusion. I added an extra section (section G) that gives you some information about this problem. I’ll tell you when the idea of possession can be applied to an example sentence in section C, but this is only for reference so that you can understand things more easily. In sentences that use the idea of “possession”, it’s usually not the main idea in relation to the logic. Another possible “surface meaning” of the preposition “of” is “origin” (which can either be “part” or “content”), but that’s not the main idea in English, so I recommend that you ignore that idea. However, I will note when we can apply the idea of “origin”. Again, this is only for reference because “origin” is not the main idea. The preposition in English that means “origin” is “from”. For both “possession” and “origin”, I separate those details in the explanations and mark them “REFERENCE”. If you want to avoid the complication and confusion, you can skip that part. C) Detailed Explanations of the Example Sentences. The last page of the book is blank. This one is extremely simple. A book has a first page, a last page, and many other pages. Each of these pages is like one individual piece/part of the book. So “page” is a more specific version of the word “part”. ALTERNATIVES: “The book’s last page is blank.” REFERENCE: As you can see, this is possession, so “last page of the book” can mean possession. ALTERNATIVES: “Today is June first.” This is the more common way to say it. I’ve never been north of Los Angeles. Note that this sentence does NOT mean the north part of Los Angeles. Instead, it means any location that is in the direction “north” starting from Los Angeles (such as San Francisco, Oregon, or Canada). If you want to talk about the north part of Los Angeles, we say, “I’ve never been to the north of Los Angeles” or “I’ve never been to north Los Angeles”. Now we’re talking about the top area of the city on a map. This can be very confusing because the preposition “to” can have two slightly different meanings in this context. Don’t worry about that right now. We’ll look at the preposition “to” soon. In the example sentence, “north of Los Angeles” means any and all areas that are northward from Los Angeles on a map. So, how does the example sentence mean a “part”? It’s a little abstract. We’re looking at all the area outside of Los Angeles (the rest of the world, or the rest of the country, at least), and based on that area, we’re talking about the part of it that is specifically northward from where Los Angeles is. REFERENCE: Lastly, you can look at this example as “origin”, but it’s very abstract and it might be confusing. Starting from Los Angeles, we’re talking about any area that is out side of the city and northward. Notice the preposition “from”. He got 17 out of 20 on his test. The test has 20 questions, so there are 20 points in total. He answered 17 questions correctly. In this case, the word “point” is a specific word for “part”, so each point is one part of the total score. His score is 17 parts out of the total 20 parts. Note: we’ll talk about “out of” later when we see the preposition “out”. REFERENCE: This sentence can be an “origin”. It’s like saying, “Starting from 20 possible points, he answered 17 correctly”. Note that we don’t say it that way in English, but the idea is there. The ideas of “out of” and “from” are very similar. Again, this is why I recommend that you ignore the “origin” idea. I like the color of the sky at sunset. This one is more abstract than the other examples, but it’s the same idea. “Color” is a part or aspect of the sky. (The sky has color, size (the big sky), etc...). REFERENCE: This sentence is a perfect example of why thinking about the preposition “of” as “possession” or “origin” can be confusing. You can look at this sentence as “possession” (the sky’s color → the color belongs to the sky); or you can look at this sentence as an “origin” (the color comes from the sky). This table is made of wood. If we try to say that the table is “part” of the wood, that doesn’t make any sense. Here, we’re talking about the material that something is made out of. The wood is the “content” or “material” of the table. It’s what the table consists OF or is composed OF. Wood is the composition of the table. All of these are different ways to talk about the same idea. Please note that normally when we talk about the “contents of a table”, we actually mean what’s inside the drawers of the table. This is because “content(s)” is usually used with the meaning “to contain”. In this case, the concept of “content” applies, but it’s very abstract. In normal language, it makes more sense to use the words “made of”, and that’s also the most common way to say this sentence. REFERENCE: You can look at this as an “origin”. The wood came from a tree, and then the table came from the wood. Notice the preposition “from”. As I said, “from” is an origin, not “of”, but they can touch, and sometimes they overlap. ALTERNATIVES: This table is made from wood: We saw in some previous examples that we can apply the idea of “origin”. The preposition that is about an “origin” is the preposition “from”. So it makes sense that in this example sentence, the prepositions “of” and “from” connect in some way. In fact, they overlap, which means we can change the word “of” to the word “from” and the meaning in this context is the same. Notice that in the first group, “from” and “of” didn’t overlap, they only touched sometimes. But group two is about the content/composition of something or what something is made of, so we can use the preposition “from” to look at the sentence in a slightly different way. This is a very good example of the difference between “touch” and “overlap”. The preposition “from” isn’t about a “part”, but it can be about “content”. However, we’ll see in the other example sentences that even in this group, “of” and “from” don’t always overlap. This is the most difficult part of prepositions: context. Prepositions have meaning, so just like with any other word, the context determines what prepositions you can and can’t use. This table is made out of wood: You can also add the preposition “out” before the preposition “of”. This isn’t always possible, but we saw in a previous example in group one that we can use “out of” when talking about an amount. This context is different, but the idea still works. Very abstract, but think of it this way: we “extract” the table from the wood. Obviously, this isn’t really what happens, but in English, we can apply the concept in a way that is abstract and not literal. As I said, this will be clearer later when we talk about the preposition “out”. This table is made with wood: The logic of the preposition “with” is simple: “together”. This example sentence is very simple. What did you use to make the table? Wood. So, you brought together the idea of the table and the physical wood and then you used the wood (in order) to create the table and make it real instead of just an idea. The exact meaning of the preposition “with” in this case is “using”. You can reword the sentence and say, “This table is made using wood”. This works because when we talk about the material that we use (in order) to make something, we use the preposition “with”. This is a picture of a dog. (Note: not possession) I put the note about possession because that’s a common mistake that some students make. This is one of the reasons why I recommend that you don’t think about the preposition “of” as “possession”. If you wanted to talk about the idea of “possession”, you can say, “This is my dog’s picture”, which means that the picture belongs to your dog. Ok, how does the logic apply? Is “picture” a part of “dog”? Kind of, but not really. It’s clear that the dog is in the picture, which means that the dog is the content of the picture. This is the same as putting a toy inside (of) a box: we say that the toy is the content of the box. I’ve always thought of him as an interesting person. This one is a little difficult and more abstract. The key is this: “him as an interesting person” is a single idea. My “thought” is not part of him, but “him as an interesting person” (which is a chunk) is the content of my thought. In other words, when I think of him, the idea “interesting person” appears in my mind. Notice in this case that we have a verb (“thought”) + “of” + a noun or pronoun (“him”). NOTE: Most of the time, we use the preposition “about” with the verb “to think”. “Think about” and “think of” are extremely close. The preposition “about” is “a scope”. For example, if I tell you to think about trees, I want you to focus your thoughts specifically on trees and not anything else. We’ll see more about this later. As we know, when we say “think of”, we’re talking about the content of your thoughts. The next two example sentences work the same way. I’ve always dreamed of living by the ocean. The word “dream” in this context doesn’t mean a dream that you have while you sleep. It means something that you really want to do. In this case, “living by the ocean” is one chunk, and it’s the content of my dream. So in this case, we have a verb (“dreamed”) + “of” + a second verb (“living”). In other words, when we use the preposition “of” with a verb after it, that action/verb is the content of the action/verb that’s before the preposition “of”. I like the idea of learning many languages. Lastly, we have another verb after the preposition “of”, but this time, there’s a noun before the preposition “of”. This works exactly the same way. There’s an idea, and the content of the idea is “learning many language”, which is a chunk. So, we have a noun (“idea”) + “of” + a verb/action (“learning”). Sometimes, a sentence can use both directions of the logic at the same time. I drank five cups of coffee. Imagine you have a big pot of coffee. You take one cup of it. That’s one “part” of the total amount of coffee in the pot. So here, “cup” is a specific word for “part”. Specifically, the size of the part is the amount that a cup holds. This sentence is also about content (A←B). What’s in the cup? Coffee. The content OF the cup is coffee. In this case, we’re not saying what the cup is made of. A cup is basically just an empty space and you can fill that empty space with some sort of content. A lot of people are at the beach. “A lot” means “a large amount”. Although you might be able to look at “amount” as a characteristic of “people”, this sentence is clearly talking about content. We can ask, “A lot of what?” What is the content of the amount? Trees? Buildings? In this case, it’s people. However, you can look at each person like a part of the total. Remember when we talked about the test that had 20 points total? The total amount of points was 20. Each point was part of the total. So, the “amount” is made of “people” AND each person is part of the total amount. ALTERNATIVES: “Many people are at the beach”. You’re probably wondering why we say “a lot of” and not “many of”. Well, we say both, but it depends on the context. We use “many X” when we’re talking about the total number of that thing. We use “many of X” when we’re talking about a large amount of the total. This is less than “most of X” but more than “some of X”. For example, “Many of the people (that are) at the beach are tall”. We’re talking about a specific group of the people that are at the beach, but not all of the people that are at the beach. So, we use “of”, because we’re talking about a part of the whole. But when we say “many people” we’re just saying that there is a large number of people as a whole. In fact, when we say “many of the people”, there might only be 15 people at the beach, and we’re talking about maybe 9 of them. But when we say “many people”, the number is bigger (let’s say 30 or 50). He died of a heart attack. Another difficult one. In the dictionary, you’ll find this example labeled as “the cause of something”, which is true, but it’s also really confusing. So, where’s the part and where’s the content in this sentence? A heart attack has a beginning, middle, and end – all parts – as well as a result (did he survive or not). It’s easy to see that death (“he died”) is the result, which means that this is the “part” of the heart attack that we’re talking about. However, in an abstract way we can also say that the heart attack is the “content” of his death. In other words, his death is made of a heart attack. How did he die? Car crash? Stabbing? No, a heart attack. ALTERNATIVES: “He died from a heart attack.” There are a few different prepositions that you can use to talk about a “result”. Sometimes, it’s a little complicated. For example, we can use the preposition “from” in this sentence. That might seem strange because the preposition “from” is an “origin”. However, the idea of “origin” can mean a “basis”, or, more specifically, a “cause”, which is a specific type of “basis”, and “basis” is a specific type of “origin”. This is a good example of the hierarchies I mentioned in the introduction. Each step gets less abstract: origin → basis → cause. Because we’re talking about a “cause”, the idea of “effect” or “result” is naturally connected. From the heart attack (the cause), the effect/result is death. We’ll see more about this later in the book when we talk about the preposition “from”. Note that we CANNOT say, “He died with a heart attack”. The logic can apply, but this is a good point about the different ways that the logic of a preposition apply. It depends on the context, which is a big reason why prepositions are so difficult to master. In this context, if we use the preposition “with”, it sounds like “heart attack” is something outside of him, like another person: “He died with his wife”. This is because the logic of “with” is “together”. Although “together” can mean “using” or “having”, when we talk about dying, it sounds like he’s together with another person or thing. It can also mean that he died in a certain position: “He died with a smile on his face”. In this case, we’re using the idea of “having”, but it’s a position that he has, not the result of his death. Basically, we can’t use “with” to mean a “result” and that’s the main reason why we can’t use it in the sentence, “He died of a heart attack”. I’m afraid of spiders. My fear is not “part” of “spiders”. Spiders are just spiders. However, spiders are the content of my fear. I might have other fears, but we’re specifically talking about spiders in this case. Now, this sentence is a little weird. Notice that if I have more than one fear, we can say that the spiders are one “part” of my fear. So, in this case we also have a “part”, but “part” goes the opposite direction than normal (Normally, “part” is A → B and “content” is A ← B, but in this case, “part” and “content” are both A ← B). Notice that we can say, “ONE OF the things (‘parts’) that I’m afraid OF is spiders”. This is a strange and rare example where the logic goes in the opposite direction, but the main point is this: the logic still works perfectly fine. She has the voice of an angel. “Voice” is part of “angel”. This is because an angel has a voice, an appearance (how it looks), a height, wings, and more. All of these things are part of the angel. But how is this sentence about “content”? Well, if someone has the voice of an angel, we can say that their voice is angelic (angel-like). So, an angelic sound or quality is the “content” of her voice in an abstract way. You might see that this angelic quality can be a “part” of her voice, which is true. Just like in the previous sentence, the idea of a “part” can go both directions. Again, the important thing is that the logic still works. REFERENCE: Obviously, this sentence does talk about “possession” because the voice belongs to an angel. However, it doesn’t really belong to an actual angel. We’re just saying that her voice sounds like an angel’s voice. ALTERNATIVES: “She has an angel’s voice.” Saying it this way is less common. This group is the most difficult because the sentences include implied information. “Implied information” is information that’s not said in the sentence, but that’s implied by the context. This adds an extra step. Instead of just A → B or A ← B, we also have a C. Let’s look at a couple of specific examples. There’s a discount of 20 percent on all purchases. In this case, “20 percent” is the content of the discount. But “discount” clearly isn’t a part of “20 percent”. What’s going on here? Well, that’s the implied information. We’re saying “20 percent”, which implies a total price. So, 20 percent is the “part”. Specifically, it’s part of the total price. What we’re really saying is: “There’s a discount of 20 percent of the total price on all purchases.” In this sentence, it’s more like A ← B + B → C. Put another way: A ← B → C (B is the content of A (20 percent is the content of the discount), but B is also a part of C (The amount that is discounted (removed) from the total is part of the original total). If the total price is $10, then 20 percent is $2, meaning that $2 is the content of the discount because it’s the specific amount that will be removed from the total (This is A ← B). However, at the same time, $2 is part of the original $10 (This is B → C). Another way to think about it: imagine you have a pie with ten pieces (“parts”) and you take two pieces (“parts”), leaving 8 pieces (“parts”). ALTERNATIVES: “There’s a 20 percent discount on all purchases.” If we say it this way, we’re using “20 percent” like an adjective to describe “discount”. I only got 2 hours of sleep last night. Can you see it? The A, B, and C are moved around a little bit, but it’s the same idea. “Sleep” is the “content” of the two hours. In other words, those two hours (A) consist of sleeping (B). So, we have the normal A ← B. And how is this a “part”? Well, each hour of the night is a part of the night. More specifically, we’re talking about hours that are used for sleeping. Most people sleep between 7 and 9 hours every night. So, the total number of hours is the implied information and then we remove two of those hours because those are the hours that you were sleeping. In the previous example, it was B→ C. In this case, it’s A→ C because we’re removing the two hours (A) from the implied total number of hours (C). Again, it’s like a pizza with ten pieces. The exact connection between A, B, and C might change, but the idea is the same. ALTERNATIVES: “I only slept (for) two hours last night.” The preposition “for” in this case is a duration/length of time.